Today, music superstars can be seen parading around in late-model Bentleys, Ferraris, Lamborghinis, and many other top tier exotic sports and luxury cars. It seems to be a given that when a musician or a rock band hits it big, fancy cars and mansions follow suit. But that wasn’t the case with John Lennon, he wasn’t known for his appreciation of these types of cars. It was George Harrison and Paul McCarthy who were known for owning fast exotic sports cars. Lennon may have started off with owning a 1965 Ferrari 330 GT 2+2 and a 1965 Mercedes 230 SL but ownership of the two only lasted for a brief period. His interest in cars resided with more practical and reliable cars. There’s no doubt that John Lennon wasn’t a car guy. To the dismay of many auto purists he had added a psychedelic paint scheme to his 1965 Rolls Royce Phantom V during the heyday of the Beatles. After the Beatles disbanded, soon thereafter Lennon moved his residence to New York City and a luxurious 1972 Chrysler Town & Country Wagon became his main means of automotive transportation. The Chrysler Town & Country provided reliable transportation during most of the 1970s for the Lennons (John, Yoko, and their son Sean). 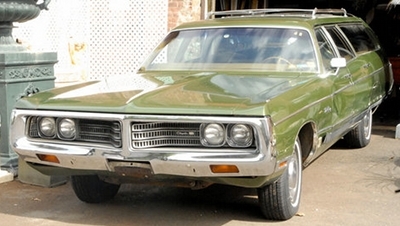 The Chrysler wasn’t showy, it was a big utilitarian vehicle. John Lennon was one of the biggest names in the music industry and had a great deal of wealth, he could have afforded the best and most expensive cars this time period had to offer, yet the Chrysler Town & Country kept him perfectly content. According the History Channel’s Lost and Found TV show (2000), the Lennon’s chauffeur who drove the mammoth Chrysler convinced the Lennons back in 1979 that the Chrysler was on its last legs and it was time for a new car. More than likely this wasn’t due to any mechanical issues but probably from the beatings inflicted on its body panels from Manhattan driving duties. There’s no geographic area in the U.S. where a car takes a heavier beating than in Manhattan which has the highest population density in the U.S. A car in this type of environment can in a few short years be littered with fender creases, large indentations, deep scratches, and other body damage from being bumped and scrapped from other cars. In other words car duty in Manhattan is to a car like doing hard prison time – it ages a car very quickly. The Lennon’s chauffeur may have been overplaying his hand since the 1972 Chrysler Town & Country in 2013 is still running today over 40 years after it left the assembly line, and in fairly decent condition with its Manhattan battle scars still visible. In 1979 the decision was made by the Lennons that the Town & Country was to be replaced. However with the Lennons enjoying the utility of their Chrysler wagon, Yoko had decided on a green Mercedes-Benz 300TD Wagon which could offer similar type utility. It was only fitting since the Town & Country it was replacing was also painted green. However as mentioned in Lost and Found, there were complications with this purchase. 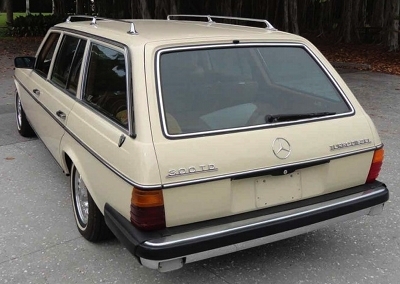 The 300TD Wagon had not been released to the U.S. market yet, but one call from the New York City area Mercedes dealership back to Mercedes headquarters in Germany fixed this dilemma fairly quick. Mercedes scrambled to get a U.S. spec Mercedes to the Lennons who paid a hefty sum of $30,000 to finalized the deal. As Lost and Found mentioned this was the same cost of Porsche’s flagship sports car at the time – the 928. The 300TD Wagon was decked out with just about every option available including power everything and an automatic climate control system. This made sense since the 1972 Town & Country was during its day the most upscale station wagon on the market. 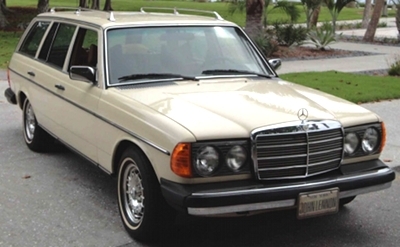 The same was true with the 300TD wagon, there wasn’t a more luxurious wagon available for 1979. The Lennons had paid a pretty penny for theirs but not only were they the first ones on their block to have one but the first ones in the U.S. to get the 300TD Wagon. The "T" was for touring and the "D" denoted a diesel motor. I think most car nuts would agree the Porsche 928 was a better option for $30,000, especially when you consider that $30,000 (U.S) is worth in 2013 about $96,000. The 300TD turned out to be a wise purchase – it provided loads luxury and utility. And the Lennons weren’t the only ones thinking on this level, Mercedes 300 wagon sales were very strong during the 1980s. And Mercedes-Benz E-Class Wagon which is the 300 Wagon’s successor is still alive and well with a brand new exterior and interior design for 2014. There’s an interesting twist to the Lennons’ purchase of the Mercedes 300TD Wagon. John and his wife Yoko began shunning the limelight by the early-1970s. This is what attracted John to the Town & Country wagon, after-all it was not the type of car a music legend would be seen in – it was a suburban utility vehicle used to haul around kids and cargo. I am sure there were lots of people who saw John Lennon in the Town & Country while it was cruising around New York City. These people probably thought that looks like John Lennon but it can’t be, somebody that famous wouldn’t be seen in such an ordinary car. In other words the big Chrysler wagon gave him anonymity. The same was true with the 300TD Wagon, it was luxurious in nature just like the Town & Country but its purpose was for hauling around kids not superstars. Celebrities back in 1979, were seen in a Mercedes 450SL roadster or a 450SEL 6.9 not a 300TD Wagon. 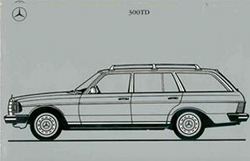 The 1979 300TD was normally equipped with a 3.0 liter I5 (inline 5-cylinder) diesel engine. It was well known for its reliability, in fact it was just about bullet proof. And it was also well known for being slower than an elderly turtle on a hot day. The 3.0 liter I5 produced 87 horsepower which wasn’t bad considering the Oldsmobile 5.7 liter diesel V8 was its main competition in the U.S. The Olds diesel produced for 1979, 120 horsepower which was only 33 horsepower more for almost twice the engine displacement. The 5.7 diesel Olds however produced 220 lb-ft of torque almost double the 125 lb-ft of the Mercedes 3.0 liter diesel. Unfortunately for GM, the Olds diesel wasn’t reliable like the Mercedes 3.0 liter. It was safe to say that from 0-10 mph that most people could run faster than the Mercedes 300TD wagon. It took a painfully slow 18 seconds to go from 0-60 mph and well over 20 seconds to hit the quarter-mile mark. These figures by comparison make the modern Toyota Prius offerings seem like super fast sports cars. However in late 1979 the turbo version of this motor would be available to Mercedes 300 buyers. Fortunately the Lennons chose the turbo version of the 3.0 liter I5 motor which bumped up horsepower to 123 and torque to 181 lb-ft. What a big difference the turbo made, even though turbo lag could be felt when the accelerator was dropped towards the floor quickly, this motor managed a 13 second 0-60 mph time which seemed closer to the performance of gasoline engines at the time, making the turbo 300 seem more attractive to many buyers. The 29 mpg highway rating also was a nice added benefit of this turbo-diesel motor, this was back when most wagons were lucky to exceed 20 mpg on the highway. Even with the turbodiesel under the hood, one has to wonder if after the 300TD Wagon arrived, the Lennons’ chauffeur missed the 190 horsepower and 310 lb-ft of torque 400 CID V8 powered Chrysler Town & Country. There’s no doubt it must have felt more powerful with an abundance of low-end torque (much greater than the turbodiesel 300TD) even in slow stoplight-to-stoplight driving. As mentioned by Lost and Found, the 300TD had a special spot in John Lennon’s history. It would be the last car he would own and it was the car that shuttled him and and his musical equipment to and from the music studio where he was recording his last album Double Fantasy which would win the 1981 Grammy Award for Best Album. Double Fantasy would also go on to be John Lennon’s most commercially successful album, spending eight straight weeks at Billboard’s number one slot. Unfortunately he would only enjoy the 300TD Wagon for a year and then his untimely death occurred on December 8, 1980. Yoko kept the 300TD for a few more years. It was sold in 1986 where it changed ownership a few times over the last few decades and even spent time at a few different auto museums. Somewhere along the way the exterior color was changed from green to a light beige (as seen in this article’s photos). It went up on the auction block back in 2011 (Guernseys set a starting bid at $70,000). It’s unknown what the final take home price was or who bought it. What is known is that Lennon’s 300TD Wagon is a very special piece of not only automotive but music history. And the buyer who purchased Lennon’s car probably is already aware of this fact.